Your handsome little boy will look debonair in our boys formal wear! No matter what style you are looking for, we have formal boys outfits and suits that are perfect. We carry a great selection of christening outfits, suits, tuxes, and everything else you could want or need. Great boys suit by Lito makes a popular option for boys looking to add a touch of formality. Great suit by Lito provides a popular option for boys looking to achieve a formal look. This Christening outfit by Lito will make your little one feel so nice. This Christening outfit by Lito will make your little one feel so nice. Jacquard vest and pant set. Follow the fashion etiquette for the Christening church ceremony and add an elegant touch with this lovely Baptism set. Your little one is sure to enjoy the pure white hue and soft texture. Suitable for little boys. Made in USA. 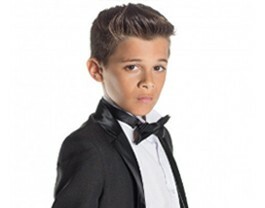 Elegant and classic boys tuxedo by Huncho. The Perfect baptism suit for that one special day, by Rafael Collection. Shop our handsome boys formal clothes and get a beautiful deal. Whether he needs a boys christening outfit, a tuxedo for a wedding or a boys suit for church, SophiasStyle.com is sure to have the perfect formal wear for your little boy.